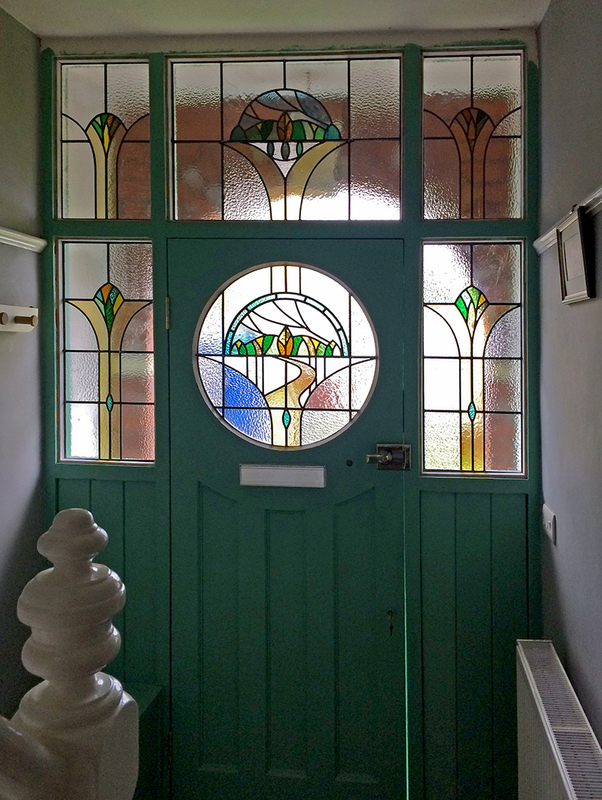 The restoration of this arts & crafts house involved creating glass to match the original remaining lead lights for windows and vestibule doors to keep the continuity of design through the hallway. 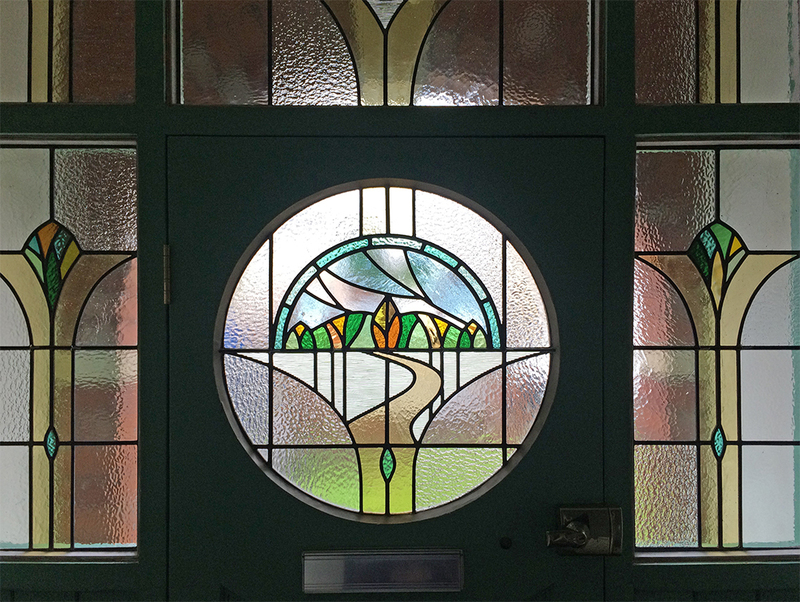 Large spun roundels were sourced from English Antique Glass to replicate the original glazing. 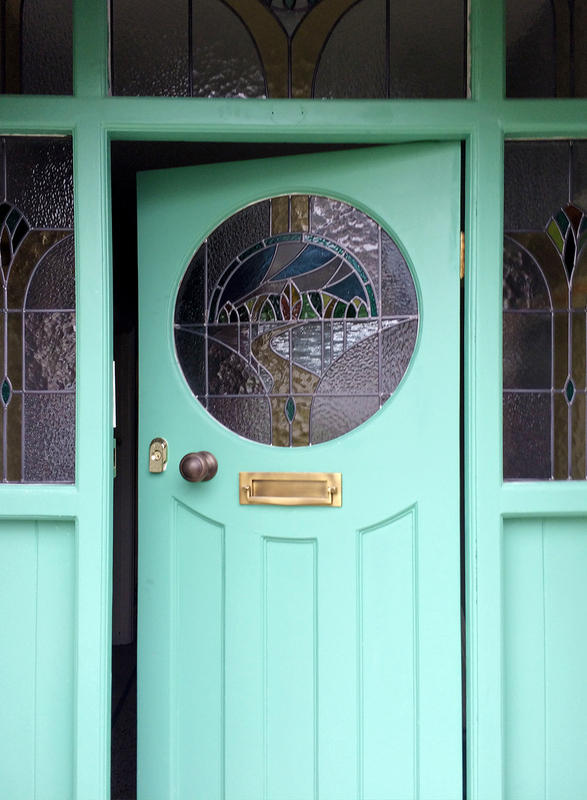 The refurbishment and repair of this 1930's entrance led to replacing all the plain glass with a new stained glass scheme with the design referencing a favourite place of the clients that personalises the design. 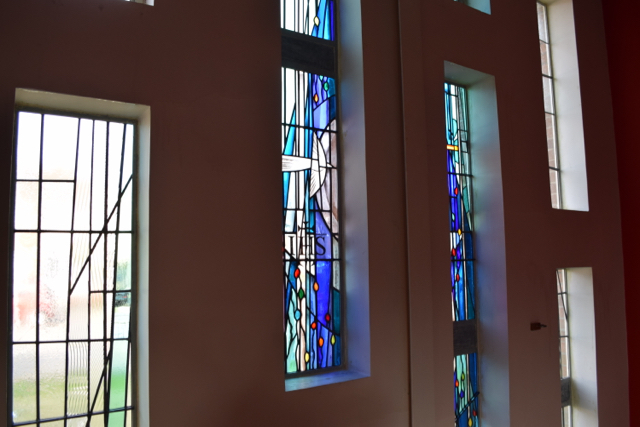 When Pontllanfraith Comprehensive School amalgamated with Oakdale Comprehensive forming the newly built Islwyn High School the stained glass window of St Francis from the library in the old school was saved and restored by us and put into a light box in the new school. This new window designed by Christian was an external window but is now internal following a new extension being built. It was kept to borrow the light from one room to another and provides an ideal opportunity to create a functional feature. A combination of handblown and rolled glass was used to modulate the light and sparkle on the surface. The subtle blues and browns tie in with the clients interior design scheme. 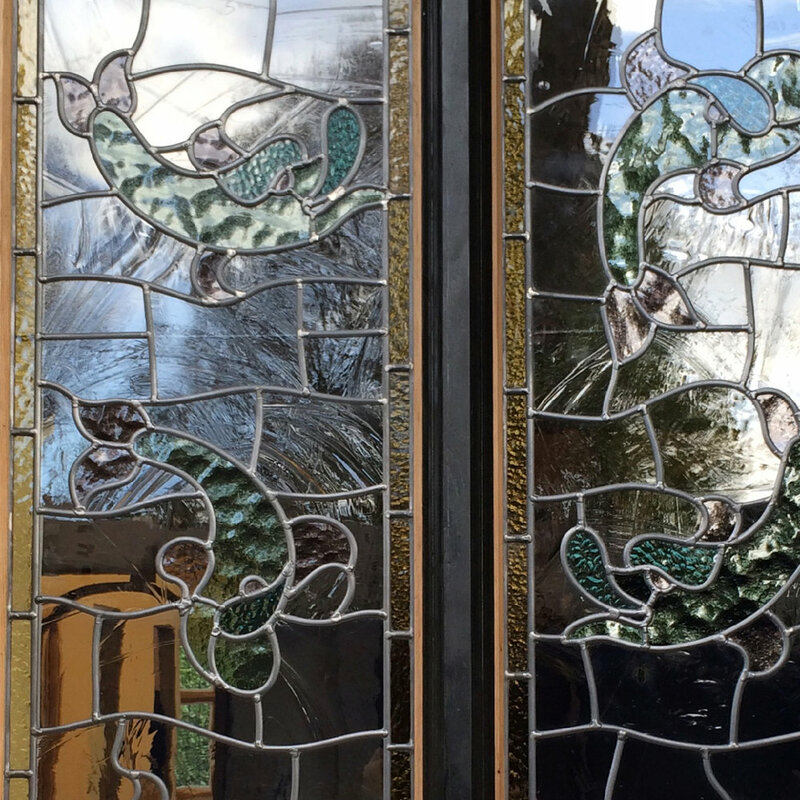 This panel was created for a new front door made by joinery conservator LM Conservation. Designed by Christian it was made to match the period of the house to replace a door of the wrong style and materials. The design was developed in conjunction with the client and had a custom fabricated support bar made. Designed for the stairway this window is a version of Christian's sapling design and uses hand blown glass and spun roundels. The colours were selected to co ordinate with the interior scheme and overall the window provides an elegant feature that catches the light and enhances the space. 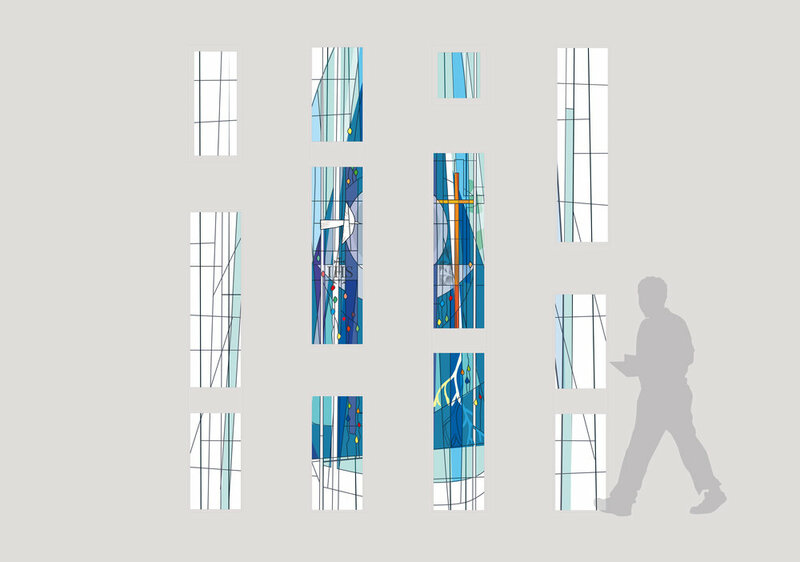 This new window designed by Christian was commissioned as a work to reflect the parish life from its origins to the current day. 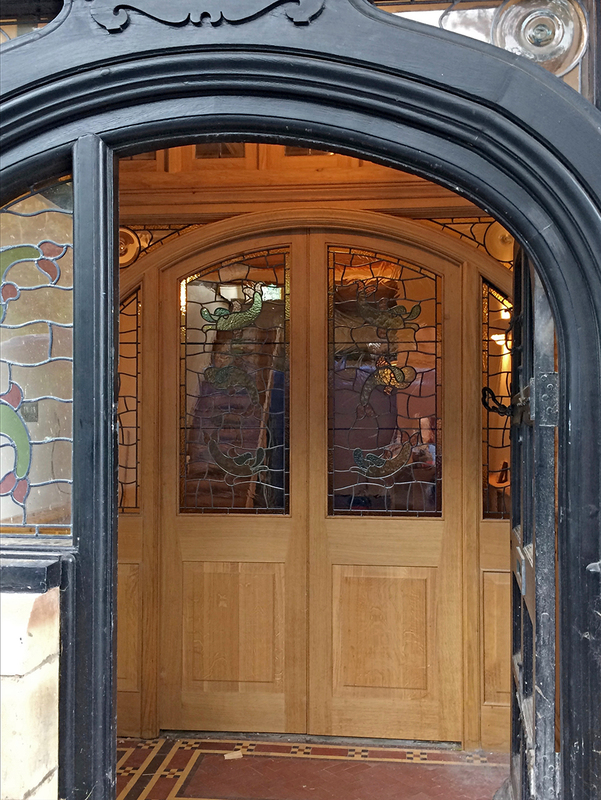 The window is full of symbolism from the shamrock depicting the Irish immigrants to the multicoloured flecks representing the multicultural parishioners of today. This project involved the removal of the two lights while a new mullion was made by the stone masons. The panels were badly bowed with pieces almost falling out and needed rebuilding with repairs to cracked pieces in the borders. The glass was very gently cleaned removing old mortar and render splashes. The profile of the lead was matched to the original and the original wrought iron tie bars stripped back, repainted and re used. 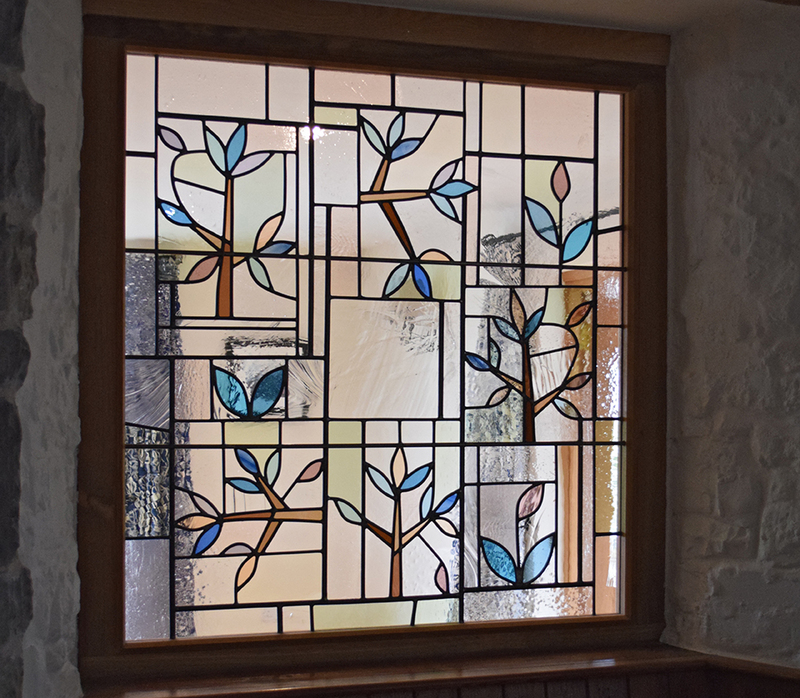 The glass was installed in conjunction with the stonemasons reinstating the mullion.